so i have a 1984 Schwinn world sport thats been languishing all summer, partially built in different itterations.. i used it last summer as a semi decent hybrid.. i was thinking of selling it outright this year but still never got around to it, its not worth much, the frame is scratched and i welded on some v brake bosses, which worked great until on of the bosses snapped... sooo.. now she really isn't winning any beauty contests..
i'm thinking of continuing our riding/running trips through the winter but i really don't want to use my nice bikes, they will all be hybrinating till spring.. so figured why not the schwinn? i have enough parts in the bin to build up a heinous hybrid of some sort.. with 700c rims and a mismatching brake setup... its really just for quick shots around the block and back, i have some old hybrid tires that i was going to throw on the rims, and i was going to wrap zip ties around the rims to provide extra traction once the snow hits. Living in Rochester, you'll probably be thinking about studded tires... Last time I looked the narrowest tire would be about 35mm... so you need to check that. However, if you are going to wait until the snow plows have cleared and de-iced the streets, this would be an excellent winter bike. Chrome fenders and run it single speed. Take thee to the Coop! Why not a mountain bike? Or studded tires on your 930? I picked up 2-3 WS over time. What a POS! Rides like a loaded dump truck. Last edited by oddjob2; 09-17-13 at 11:36 AM. Kind of what I did. I changed it to single speed after I took this picture. Studs don't work for me, then again, I'm using it as a commuter. I will also suggest you scrap this one and pick up a used MTB, should be able to find one real cheep and just give it a tune-up. it will ride so much better in the snow and you will have lots of studded options if you decide you like it enough to go that route. Or sell it in the spring when the market picks up and buy an MTB now when the market is a bit down. Rigid MTBs make the best platform on which to build a commuter since it will tolerate a wide range of mods. Plus the upright sitting position is pretty good when the roads are dicey. I seem to recall recently Gordotrek was building a step through for his bride? Hope you finished that before the dog bike! oh the wifey has a nicely built up panasonic, i still need to take pics of that one.. she is still getting used to the drop bars tho, i may need to swap out the aero brakes for something with a smaller reach, she has tiny hands..
Pounding over frozen tire tracks, dropping into slush filled potholes and traversing cinder covered roadways is not going to las long on skinny tires and light rims....listen to the choir...."get thee a MTB!" Even a BoxMart MTB. The cheapest garage-sale/garbage-picked MTB would be better than subjecting your Schwinn to those duties!!! I have several 'beaters' that I've 'picked' off treelawn on garbage day! Last edited by Cougrrcj; 09-17-13 at 01:45 PM. How are you going to brake with zip ties on the rims/tires? I'm curious to see this with the cantilever studs welded on. I've thought of this modification on a junk commuter before, but never went through with it. fixed gear and zip ties! I'm going to go ahead and disagree with you there... 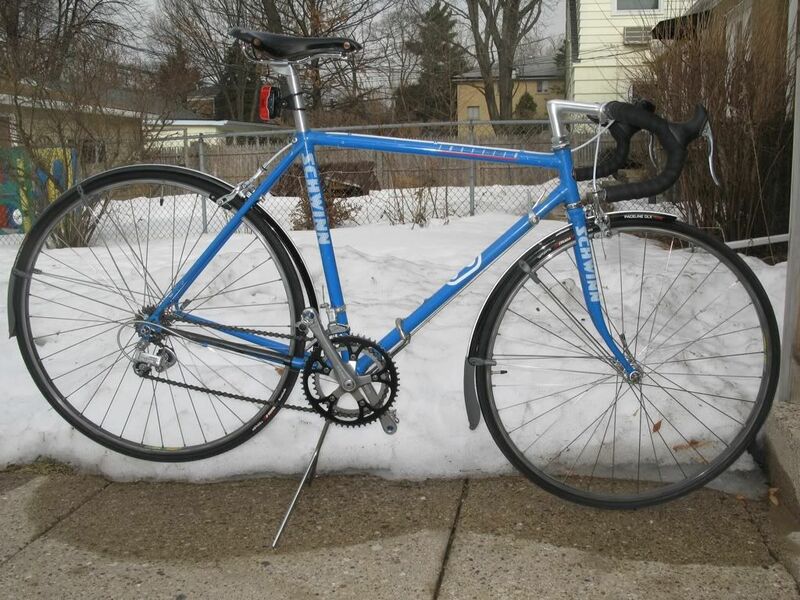 I've been commuting on a vintage road bike through Detroit, Michigan for 5 years now I find the knobby tires just collect snow in the treads and I've never had an issue running Continental Gatorskins. I even rode 13 miles to work in 8" of freshly fallen snow...Only took 15 more minutes than usual. No hills or even rolling terrain in Detroit. Hills and rolling terrain in Rochester, plus the snow is wetter/icier. Get a MTB. I was using an old Specialized Hard Rock till a driver last summer decided to run a stop sign. I still have it but I need to get a new grip shifter before the snow flies. I had switch over to some tires with less tread was making a run to Micky Dees when I had the accident. Know the area well. My training runs are from Deerborn to S Lyon. Pffft! And you call yourself a C&Ver ? Go sit in the corner and think about what you said, young man. I'd do a single speed or possibly a suicide hub fixie. A fixed gear schwinn with very slack angles (and very big lights) was my favorite winter commuter. It gives you a great feel for road conditions through the pedals. Narrow tires work on cleared roads; I have frequently come to a stop and put my foot down, only to have my boot slide away from me. My only trepidation would be learning to ride a fix with a pooch on the line. In fact, I don't know any good way to run a dog from a bike. How do you do it? I'm going to go ahead and disagree with you there... I find the knobby tires just collect snow in the treads and I've never had an issue running Continental Gatorskins. .
No knobbies, I'd run 45mm or better street tread, like Pasela TG. If the roads are bad and ice is an issue, I'd have an extra set of wheels set up with studded tires. The point is, an MTB has a studier frame, you can run wider tires with fenders, the wheels sets will stand up to the abuse, you can run a shorter frame with a higher seatpost and headset to gain some stand over inches for those "holy crap!" dismount moments. Take a look at the MTB with drop bars thread, there are a whole bunch of winter bikes posted there. Many will be as fast or faster than a skinny tire bike on snow covered or wet roads. Just get a long board skateboard and let the pooch pull. Ice skates/snowboard after that white stuff falls.